Distributors aren't being used on the newer cars: if you have a fairly new vehicle you probably don't have one! Still, many vehicles on the road still have distributors, and I get a lot of questions about them. First some basics: The distributor is part of the ignition system. When an engine runs, a sparkplug ignites the fuel/air mixture at the top of the Compression Stroke of each cylinder. This has to happen at exactly the right time. This is called Ignition Timing. On a multi-cylinder engine unless you want to have an ignition coil for each cylnder (some new cars do this!) you have to have a way to "switch" the coil fire from one cylinder to the other. That's one thing a distributor does. 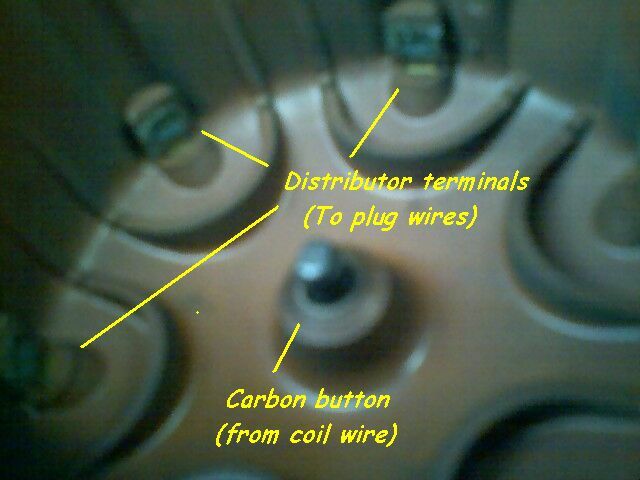 The distributor cap has terminals arranged in a circle. The spark plug wires plug onto the top of these terminals. 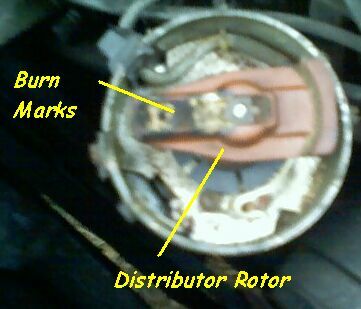 The Ignition Rotor spins around inside the distributor cap. It "points" to each cylinder's terminal on the distributor cap when it is time for that cylinder to fire. The rotor has a metal strip across the top . A graphite rod contacts this strip in the center of the distributor cap. The coil wire connects to this terminal. 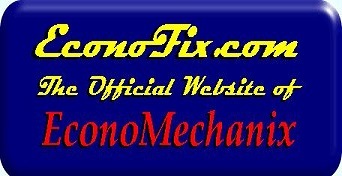 Ignition timing is also often controlled partially or totally by the distributor. In the older cars a set of ignition breaker points were opened by lobes on the distributor shaft. Later ones use a variety of electronic, magnetic, or optical sensors running off the distributor shaft to control the ignition timing via a computer or electronic module, or both. The distributor can fail in many ways. Many cars have the coil inside the distributor. On any car, look carefully at the cap inside and rotor. Look for any black streaks: these can be carbon arcs which can make the engine misfire, especially in wet weather. Rotors can burn through to the distributor shaft and cause a no start condition. You will have spark coming from the coil, but none to the plug wires! I can't get into electronic ignition diagnosis here! Too much stuff! Get a manual! Remove the distributor cap. "Bump" the engine over until the rotor is pointing to the mark on the distributor. Go to the engine ignition timing marks. These are usually either on the front crankshaft pulley (also called the harmonic balancer or vibration dampener) or on the flywheel, where it can be seen through a "hole" by the transmission or transaxle. Rotate the engine by hand to exactly align the timing mark to TDC, compression stroke, or even better, to whatever the ignition timing is supposed to be. If you want to do it the "quickie way", you might do it the following way, especiallty if you are going to put the same distributor back in. Remove the cap. Look where the rotor points. use a scribe (screwdriver will do) to make a scratch mark on the edge of the distributor so you can see where the rotor needs to point when you put the distributor back in. No matter which way you do it, next make another mark across the base of the distributor and across onto the engine, or to a spot on the engine and distributor that you can use to align the distributor in the same place . Remove the distributor hold down bolt(s). Twisting the distributor back and forth while pulling outward should remove it. Some distributors can have a sludge buildup on them making them hard to get out. Some penetrating oil can help. just keep working it from side to side and it will come out eventually! Many distributors have an offset notch on the base and can only go in one way. These are easy: stick it back in and align your marks. The more difficult ones have a gear on the bottom and also drive the oil pump. The gear on the distributor often has angled teeth making the rotor turn as you insert the distributor. On the cars which use the botom of the distributor to drive the oil pump, the oil pump drive often will not go into the bottom of the distributor shaft without rotating the engine. The distributor will go in ALMOSTall the way, but will lack about a 1/4 inch . DON'T FORCE IT! YOU CAN DAMAGE THE OIL PUMP DRIVE OR DISTRIBUTOR!!! The trick is to start the rotor off behind the place where you want it to be (your scribe mark). It will go in part of the way and almost reach the place you want it to be. If the oil pump drive shaft doesn't go in, have an assistant spin the engine over with the starter. 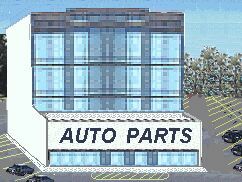 The distributor will usually drop in by itself as the oil pump drive rod seats into the distributor shaft. If not, rotate it from side to side while pressing gently in to allow the drive rod to seat. Remove the distributor bolts and distributor. Don't put the engine on TDC compression. Make no marks. You've got a problem, but not an impossible one. Your first step is to get the motor on TDC Compression. Remove #1 sparkplug. Either stick your finger lightly in it, or stick a piece of paper towel in the plug hole. If you use a piece of paper make sure it's big enough to not get drawn into the plug hole! I recommend the finger with an assistant to "bump over" the engine. Don't worry: it won't hurt your finger! Spin the engine over. When it blows your finger out of the plug hole, you know you are on the compression stroke of #1 cylinder. 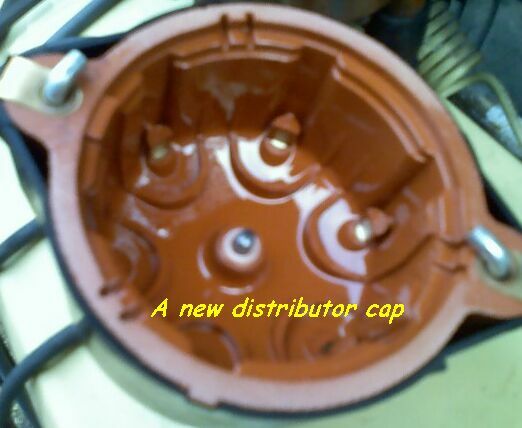 Put the cap on the distributor. Make a scratch on the side of the distributor in line with the #1 plug wire terminal on the cap. This is the scratch mark you need the rotor to point to. Insert the distributor as outlined above. 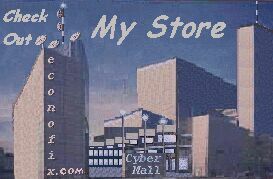 >>NEED TO BUY A DISTRIBUTOR?